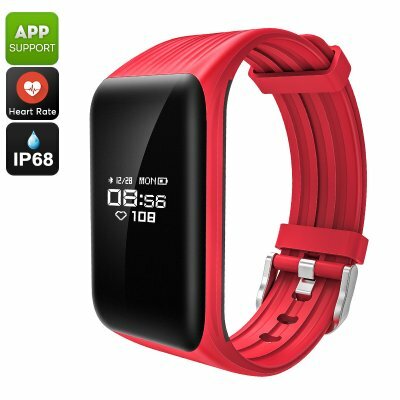 Successfully Added Fitness Tracker Bracelet - Pedometer, Heart Rate, Distance Tracker, Calorie Counter, Call Reminder, IP68, Gesture Wake (Red) to your Shopping Cart. If you’re having trouble staying motivated in exercising, this fitness tracker bracelet is perfect for you. This smart health tracker comes with a sedentary reminder that makes sure you’ll never forget an upcoming workout session again. With a number of high-end fitness features, this sports bracelet makes it easy and fun to work towards your future fitness goals. The fitness tracker bracelet can be paired with both iOS and Android smartphones through Bluetooth. Once done so, it provides you with a clear overview of your daily activity levels. This makes it easy to analyze your progress and motivates you to live a healthier lifestyle. The Bluetooth sports bracelet features a soft TPU strap which makes it comfortable to wear. On its 0.66-Inch display, it treats you to real-time health and fitness information. The fitness tracker comes with a pedometer that counts your daily steps. It furthermore keeps track of the distance you have covered and calories burned throughout the day. Additionally, it comes with a heart rate monitor that provides you with an accurate heart rate reading on which you can adjust the intensity of your upcoming workout sessions. Thanks to its sleep monitor, you can be assured that you’ll always get the proper amount of rest before starting your next workout. With its touch button design, this watch makes it easy to browse through all its features. The watch furthermore supports a gesture wake mode. This feature turns your watch on automatically whenever you raise your hand. With its 105mAh battery, the gizmo brings along up to 7 days of usage time on a full charge. Besides all its sports features, it also supports call, message, and social media notifications. Therefore, you’ll never have to worry about missing out on an important update again while you’re in the gym or out for a hike. The Bluetooth watch is IP68 waterproof, meaning that you can use it in any weather condition.